Our easy and affordable solutions prepare you for anything: from an employee accidentally deleting a critical file from the server to an earthquake destroying your server, we can help ensure that your business data is protected at all times. Incomplete backups expose businesses to risks such as lost data, lost employee productivity, and lost business–yet many small and medium-sized businesses continue to have incomplete data protection plans. For some, the costs and complexities of backup seem overwhelming. 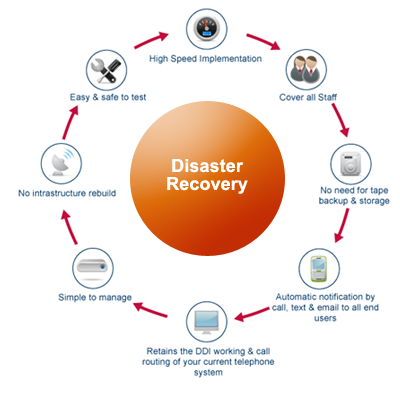 Protect your mission critical data and applications from a site failure with disaster recovery strategies that automate backup and recovery, server clustering, and data replication to meet your business requirement. Our easy and affordable solutions prepare you for anything: from an employee accidentally deleting a critical file from the server to an unexpected accident destroying your server, We help ensure that your business data is protected at all times. Data is transmitted to and stored in the Symantec data center using 256 bit AES encryption ensuring protection of your data. desktops, laptops, and servers located in main, branch or remote offices. Don’t risk losing it all. What you need is a backup solution which offers both onsite backup for high performance backups and retrieval of lost files plus a cloud backup capability for off-site disaster recovery. Easily recover critical data through any internet connection. Protect your data, protect your livelihood. Encrypts data and backs up to local servers while data is in transit and at rest in secure, off-site data centers and restores to any Internet-connected laptop, desktop, or server. Or, backs up directly to the cloud without the need for additional hardware. A fire outage has caused servers to be inaccessible. The company assures their customers all is well. They have a disaster recovery plan in place, and every customers information is backed up and secure. Due to the server company’s ability to quickly access and restore files from anywhere, the office is able to keep their business up and running, seamlessly, with no downtime. More of your employees are working in the field and losing business information on their laptops can damage your company’s reputation. Not to worry—all the information on their laptop is encrypted so proprietary information doesn’t get into the wrong hands and all of the employees files can be easily restored to a new laptop in minutes avoiding lost productivity. One of your business’ servers has crashed and lost all your critical business data. Not to worry-- your entire system state and data was all saved during the last backup. You quickly fire up your standby Virtual Machine of that server and continue business as usual -- avoiding major downtime and productivity loss.